Happy Monday! Can you believe it's already December 1st? I put up our Christmas decorations after dinner on Thanksgiving day, and I am ready to dive into all things holiday related! That includes some (semi-last minute) gift making! I thought I'd share a few of my go-to projects and patterns that you can make in a jiffy. A mix of my own and favorites from others! My advent calender is all ready to go! 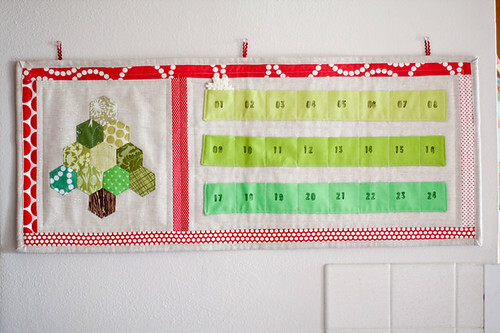 It's the Countdown-to-Christmas Advent Calender by Kaye Prince, in the book Pretty in Patchwork: Holidays. The project I make the most around the holidays is Lined Drawstring Bags. The pattern version has eight sizes, plus custom sizing, and they all make great gifts on their own, or as eco-friendly reusable wrapping for other gifts. I like making the largest size to gift quilts! I gifted several along with Amanda's Knitting Needle Wallet, for the knitters in my life. Zipper pouches always go over well, try the Triplizip Pouches for something simple, or Anna's awesome Open-Wide Pouches. 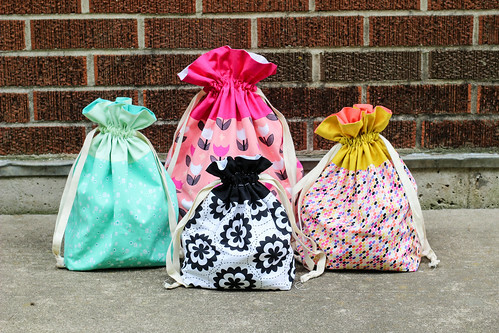 The Sewcial Tote Pattern has three straightforward tote bags, perfect for gift giving. Really short on time? How about a handmade Key FOB? I always end up making a few accessories every year, namely scarves! Use my Quick Scarf Tutorial to make a simple scarf (pom-poms optional but awesome! ), or try your hand at Shannon's Infinity Scarf! Coffee Cozies are always a hit and can be made assembly line style. Make warm mittens from a thrifted sweater! A Jolly Apron might come in handy this season too! Handmade pillows and decor items are a great route to go for gift making. Everyone loves pretty things is display in their home! A pair of Modern Plus Pillows would make a lovely gift! Or maybe a Mystery Quilted Pillow! Attractive grocery bag holders can be hard to find, and are super useful! Spruce up a few ready-made tea towels with my tutorial for a quick hostess gift, given alone or with some nice wooden spoons. 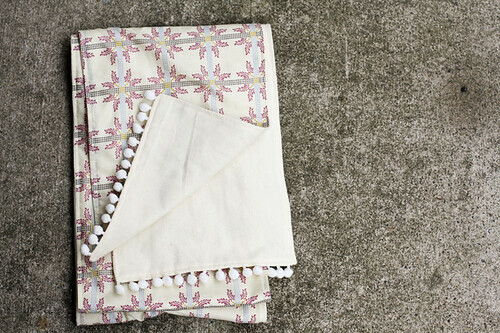 This Eight times the Fun table runner would also make a great gift! These Log Cabin Coasters whip up in no time! I love giving quilts as gifts, and it's not too late to make one for someone this year! 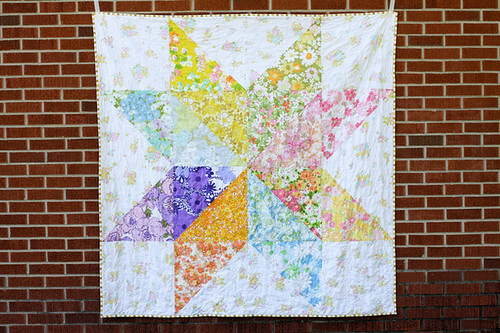 My favorite super quick, big impact quilt for gifting is my Giant Vintage Star Quilt Tutorial. It whips up in no time, I made the tutorial version in 24 hours! 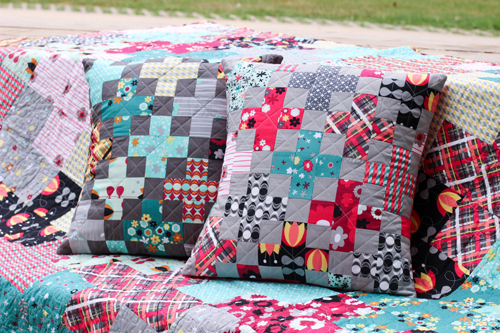 Simple patchwork quilts like the Lazy Daisy Throw or the Stellar Throw are great gift quilts too! The big braid from the Side Braid Pattern and Arithmetic made with 8" squares also come together quickly and have a little more interest! Finally, I want to share my favorite holiday treats to gift! 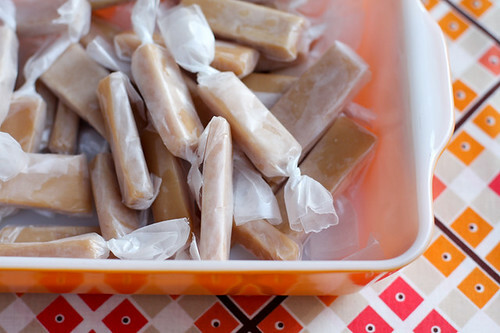 I make these salted caramels every year, they're awesome! I now make them in one of these silicone pans, it makes packaging them so much easier (I wrap them in wax paper). This salted caramel sauce is delicious too! My favorite holiday cookie is chocolate pretzel cookies. I also usually make white chocolate chex mix, which looks extra festive with red and green M&Ms.